Raised the small, wonderbread community of Mercer, Pennsylvania by his mother's parents, Michael Trent Reznor is the principal culprit responsible for taking the harsh electronic musical form frequently referred to as "industrial" -- pioneered by fringe bands like Cabaret Voltaire and Throbbing Gristle in the late 70s and taken in a more aggressive direction by Foetus, Skinny Puppy, and Ministry (amongst others) in the early 80s -- and transforming it into a commercially viable, mainstream genre at the onset of the 1990s. In the very early years of his life Reznor displayed a clear affinity towards music, and at the age of 5 his first musical training was provided in the form of piano lessons; by his teens, this training had broadened to include saxophone and tuba in both jazz and marching band styles. His activities also extended into the dubious realm of high school musical theater. Following his graduation from high school, Reznor continued his musical education at Allegheny College in Meadville. During this same period he assumed keyboard and lead vocal duties for the new wave act Option 30, which maintained an active performance schedule around the Meadville area. The band never released any recordings during its existence, but a demo tape that included covers of songs by Icehouse, Thompson Twins and Falco was recorded in 1983, and eventually released by the Shriek label with additional material in 1997. A year after his enrollment in college, Reznor dropped out and moved to Cleveland with schoolfriend Chris Vrenna with the intention of becoming a full-time musician. In Cleveland, he successfully auditioned for the rock band The Innocent, but this association lasted only a few months: not long after contributing keyboards to their sole album Livin' in the Street (1985), Reznor quit to find more promising musical opportunities. In 1986 Reznor signed on with Exotic Birds, a synth-pop act formed in 1983 and fronted by guitarist/percussionist Andrew Kubiszewski. After contributing keyboards and backing vocals to the band's second effort L'Oiseau, he brought in Vrenna to replace founding drummer Tom Freer; this new configuration did not produce any recordings, however, and both Reznor and Vrenna left the line-up by 1988. In the interim before his departure, the musician received what at the time was the most significant exposure of his career from an appearance in the Paul Schrader film Light of Day (1987), portraying the keyboardist of a fictional rock group named The Problems alongside fellow Exotic Bird Frank Vale and 'bandleaders' Michael J. Fox and Joan Jett. In 1987 his usual keyboard/backing vocal credits were also added to the considerably more obscure White Lies single by yet another synth-pop act, Slam Bam Boo. After abandoning Exotic Birds, Reznor found employment at Bart Koster's Right Track recording studio, where he began to work out demos for a solo project. Adopting the name Nine Inch Nails, he found an unexpected level of interest in his blend of mainstream and underground styles, and a contract with the independent TVT label was arranged soon afterwards. His debut release Pretty Hate Machine surfaced on the label towards the end of 1989 -- initially receiving notice only in industrial/goth circles, but steadily gathering more attention from dance and modern rock audiences over the following year as a result of the singles Down In It and Head Like A Hole (the latter benefiting in particular from substantial rotation on MTV). A band that featued Vrenna on drums and former The Act guitarist Richard Patrick was subsequently assembled, and this live incarnation of Nine Inch Nails continued to expand its audience by serving as the opening act on tours by Skinny Puppy, Peter Murphy and The Jesus and Mary Chain. Over the next year and a half, Pretty Hate Machine continued to attract a larger and larger following for Reznor -- the culmination of this process being brought about by Nine Inch Nails' inclusion in the first Lolapalooza touring festival. The recording end of his fortunes did not fare quite as well: aggressive interference from TVT executives during work on the follow-up to Pretty Hate Machine had provoked the musician to attempt to terminate his contract, and the resulting lawsuit prevented any new releases from materializing until 1992. Guest performances on albums by Pigface and 1000 Homo DJ's remained his only recorded appearances until an arrangement with Interscope allowed him to establish his own subsidary label Nothing Records, through which the Broken EP was subsequently released in 1992. An accompanying remix CD Fixed was also released that year, featuring input from Foetus and Coil -- both important influences in Reznor's musical development. To record his next album, Reznor established a studio in Los Angeles at the same mansion where Sharon Tate had been murdered by Charles Manson's followers; the house was demolished three years later, at which time he relocated his base of operations to a converted funeral home in New Orleans (although with the front door of his former premises in tow). 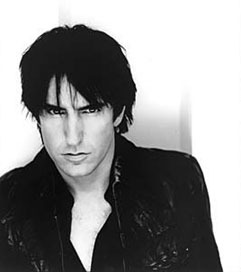 Despite having finally established a stable business context for his work, Reznor's recorded output continued to be sporadic -- his second full-length effort The Downward Spiral not being released until 1994, and the third effort The Fragile (1999) only surfacing after another 5 year gap. His work as a producer and engineer was considerably more prolific, and between 1994 and the start of the next decade he was involved in (sometimes multiple) releases by Marilyn Manson (one of the first bands Reznor signed to his Nothing label), KMFDM, Skin Diver, Prick and David Bowie, as well as adding guest vocals to the track Past the Mission on Tori Amos' second album Under the Pink (1994). Two significant ventures into film music were also made, beginning with his production and composing credits for Oliver Stone's Natural Born Killers in 1994, and continuing with his involvement in David Lynch's 1997 film Lost Highway. Reznor also produced the soundtrack to the video game Quake (1996). In the 00s Reznor continued his pattern of occasional output with Nine Inch Nails, issuing the remix collection Things Falling Apart in the first year of the decade, and only following up with the live document And All That Could Have Been two years later. Nothing Records folded in 2004. His fourth studio offering With Teeth finally arrived in 2005, six years after its predecessor.